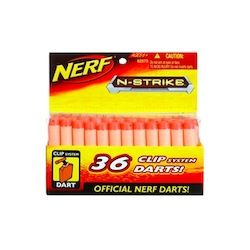 Load up your NERF LONGSHOT CS-6, N-STRIKE RECON CS-6, or RAIDER CS-35 blaster (each sold separately) with this 36-pack of N-STRIKE series Clip System darts and keep the game going even longer! These foam darts are specially designed for high-flying, high-performance blasting. Ages 6 and up.